B&H collects sales tax on orders shipped to any state which requires that local sales tax be added to the order total on remote purchases, including any shipping charges. You may be responsible for state and local sales/use taxes when filing your tax returns. Please check your local sales tax laws. 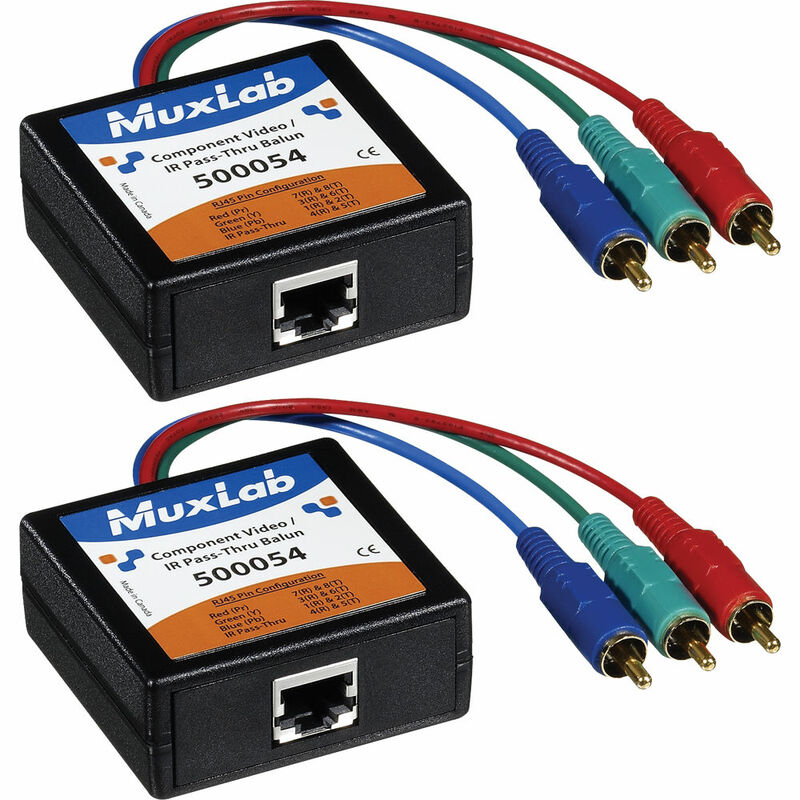 The Pair of MuxLab 500054 Component Video/IR Pass-Thru Baluns (Male) allow transmission of a component video (YPbPr or RGB) signal and an IR-emitter signal using a Cat5E/6 UTP (Unshielded Twisted Pair) cable. When used together, the Component Video/IR Pass-Thru Baluns support applications that use 480i/p (up to 1000') and 720p and 1080i/p (up to 500') HDTV (hi-definition) video. 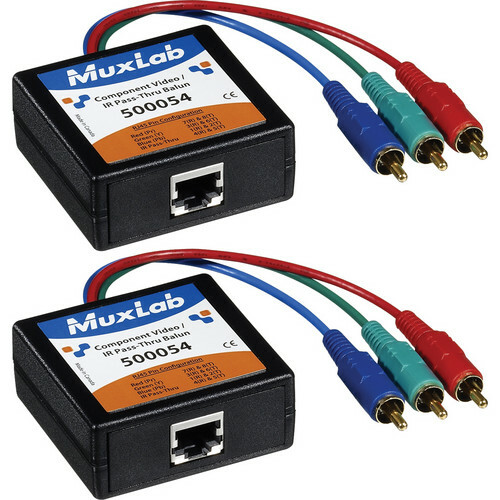 It offers support for IR-emitter pass-thru on a fourth twisted pair, and features molded color-coded RCA cable leads and modular shielded RJ45 connectors for an easy attachment. Besides Cat5E/6 being a cheaper alternative to coaxial cabling, the use of the balun also makes changes and additions easier. Providing hassle-free cabling solution, the balun connects to equipment that includes DVD players, satellite receivers, plasma displays, projectors, monitors, up-converters, amplifiers, switchers, home theatre and other equipment supporting HDTV component video and IR control. Box Dimensions (LxWxH) 5.5 x 4.5 x 2.2"